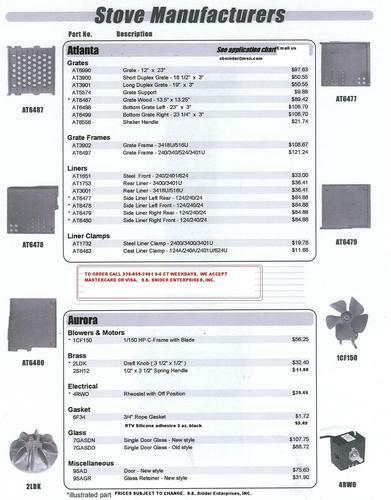 TO ORDER PARTS: 336-701-0555 10-6 EST WEEKDAYS. WE ACCEPT MASTERCARD, VISA, American Express & Discover. brands of stoves that we sell replacement parts for. 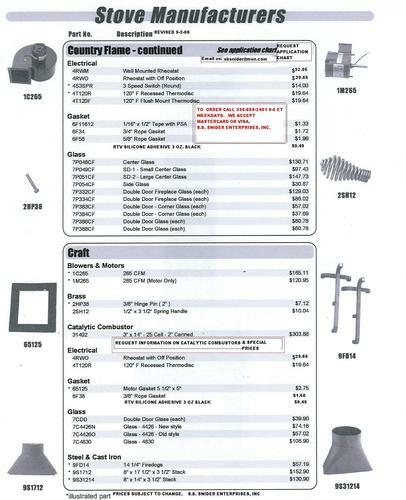 SCROLL DOWN FOR PARTS LIST: APPALACHIAN, AURORA, BLACK BART, CAROLINA, CEMI, COUNTRY COMFORT, CRAFT, DOVE, EZ INSERT, GIBRALTAR, GRIZZLY, HAWKE, HITZER, HOT BLAST, JENSON, JOHNSON, NASHUA, OMEGA, RITEWAY, SHEANADOAH, SIERRA, SILENT FLAME, SQUIRE, SWEET HOME, TREEMONT, US STOVE, VIRGINIAN, WESTLAND, WARM MORNING, WOOD CHUCK, XTEC. 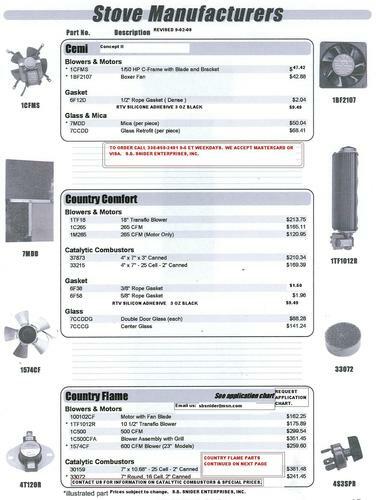 We also have parts lists and additional information that we can Email, Fax, or Mail you for: ASHLEY, ATLANTA, BLUE RIDGE, BUCK, COUNTRY FLAME, HEATMASTER, HIGH VALLEY, JOTUL, KING, LILLY FURNACE, LILLY STOVES, MEAL MASTER, SUBURBAN, US STOVE. 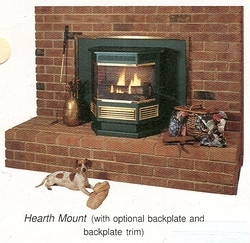 Also available, other parts that will work on many brands of stoves including: blowers, electrical parts, hinge pins, spring handles, draft caps, firebrick, gasket & adhesive, trim panel insulation, high temperature stove paint, firedogs, grates, transitions & more. WE SELL REPLACEMENT CATLYTIC COMBUSTORS (with a 5 year limited warranty) FOR MOST BRANDS OF STOVES, We can Email you informaton on combutors including: photos, price list, additional information. Also PYROCERAM III GLASS CAN BE CUSTOM CUT FOR MOST STOVES. 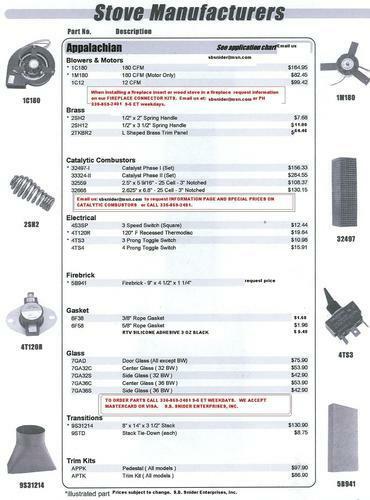 TO ORDER PARTS PH 336-701-0555 10-6 EST WEEKDAYS. NOTE: DUE TO PRICE INCREASES FROM OUR SUPPLIERS MANY OF THE PRICES LISTED ON THIS PAGE HAVE CHANGED. 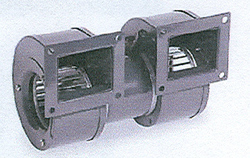 REPLACEMENT STOVE BLOWERS & MOTORS.........Email us to receive information on stove blowers. 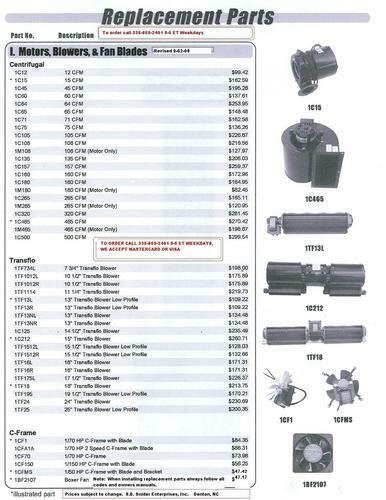 Scroll down for more information and prices for BLOWERS & MOTORS............................................Also PARTS LISTED BY STOVE MANUFACTURER BELOW. 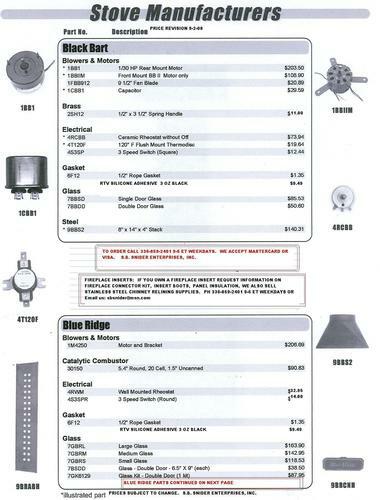 REPLACEMENT ***CATALYTIC COMBUSTORS***. 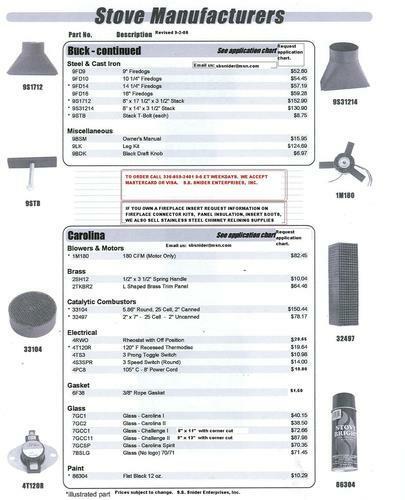 We have catalytic combustors available for most brands of wood stoves, Email the MAKE and MODEL NUMBER of your stove and we will send information and prices or call 336-701-0555 9-5 ET. CUSTOM CUT ***GLASS***: PYROCERAM III HEARTH GLASS, MICA also available. 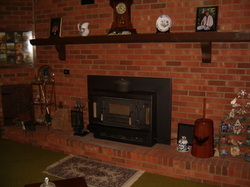 We also have STOVE GLASS Ready to Ship for many brands of stove. ALSO DOOR & WINDOW GASKET & ADHESIVE, FIREBRICK. 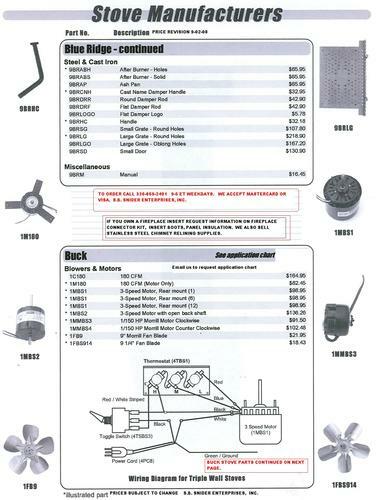 REPLACEMENT STOVE BLOWERS (Click on photo above to enlarge)...........additional BLOWERS listed below. 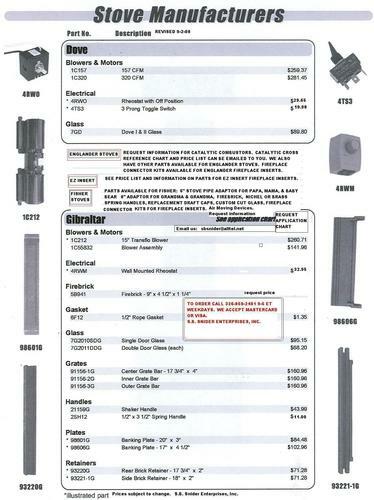 ADDITIONAL BLOWERS, BLOWER ASSEMBLIES, MAGIC HEAT, HINGE PINS, SPRING HANDLES, DRAFT CAPS....(Click on photo above to enlarge)...................Scroll down for list of parts by STOVE MANUFACTURER..
APPALACHIAN PARTS........ CLICK ON PHOTO ABOVE TO ENLARGE......... Email us to request application chart. 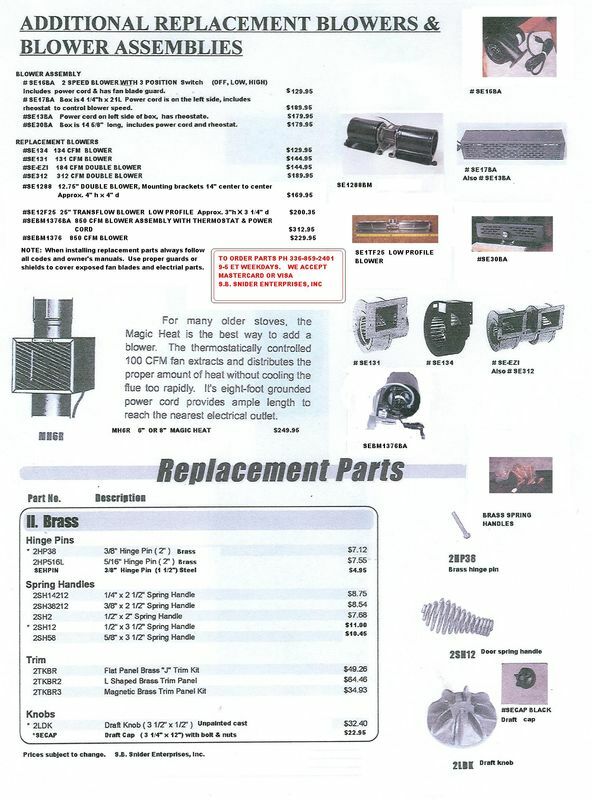 ASHLEY PARTS....... Click on photo above to enlarge............ Email us to request application chart. 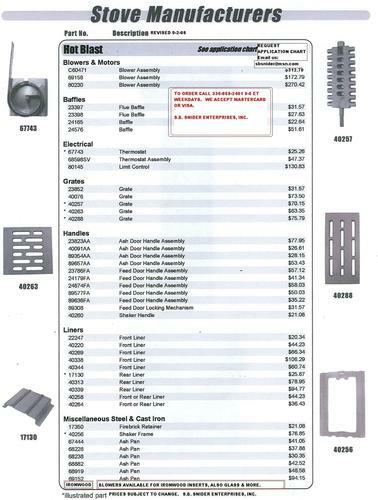 ATLANTA & AURORA PARTS..................... Click on photo above to enlarge. 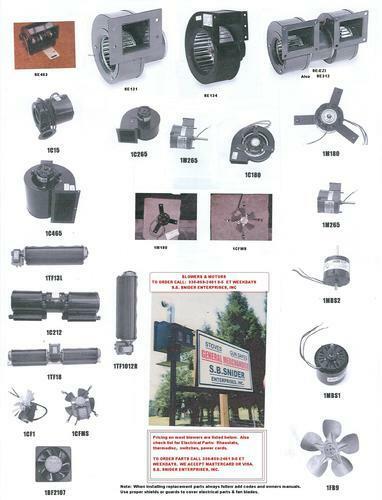 BLACK BART & BLUE RIDGE PARTS......................... Click on photo above to enlarge. BLUE RIDGE (cont.) & BUCK PARTS...................... Click on photo above to enlarge. 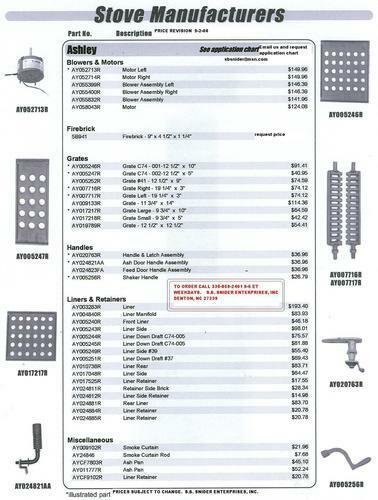 Email us to request application chart for Buck Stoves. BUCK STOVES(cont.) Click on photo to enlarge. BUCK STOVE(cont.) & CAROLINA PARTS............... Click on photo above to enlarge. Email us to request application chart. CEMI, COUNTRY COMFORT, COUNTRY FLAME. Click on photo above to enlarge. COUNTRY FLAME (cont.) 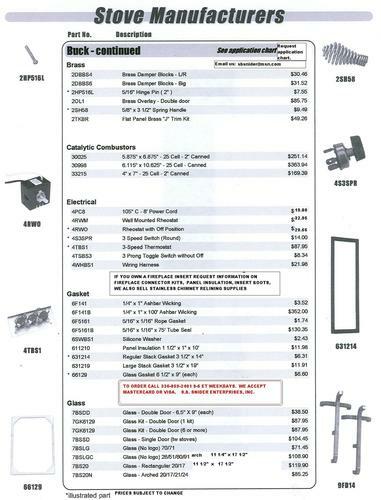 & CRAFT PARTS.................... Click on photo above to enlarge. DOVE & GIBRALTAR. Click on photo above to enlarge. Also ENGLANDER, EZ INSERT, FISHER. 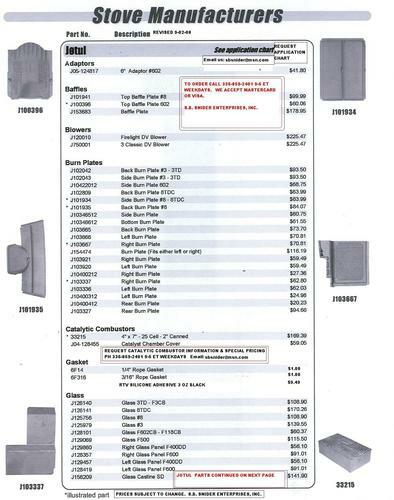 E-Z INSERT PARTS......................... Click on photo above to enlarge. 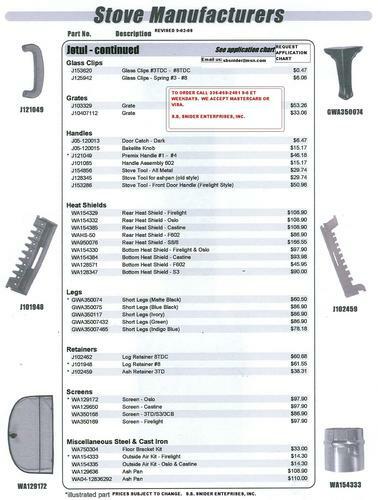 GRIZZLY & HAWKE PARTS............................. Click on photo above to enlarge. 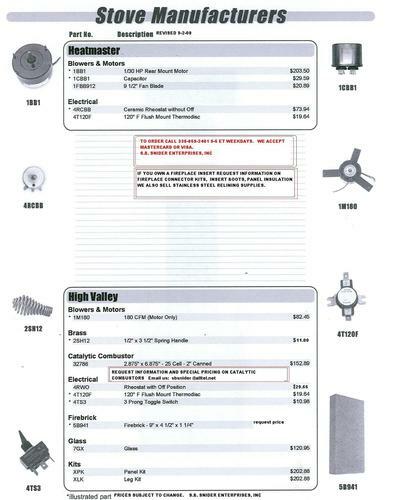 HEATMASTER & HIGH VALLEY PARTS........................... Click on photo above to enlarge. 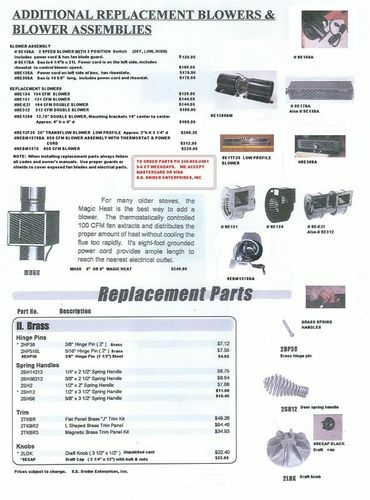 HITZER PARTS.............................. Click on photo above to enlarge. HOT BLAST PARTS.................................Click on photo above to enlarge. 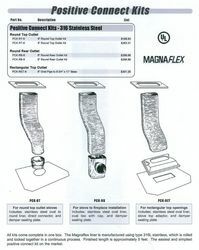 ***-POSITIVE CONNECT KITS- *** Positive connect kits for use in fireplace to connect fireplace inserts & stoves (these kits can be shipped) Also request information on FLEXLINE FIREPLACE CONNECTORS..........IF YOU ARE READY TO PURCHASE A NEW WOOD STOVE, FIREPLACE INSERT, PELLET STOVE, MULTI-FUEL STOVE, CORN BURNER, or GAS STOVES AVAILABLE FOR PURCHASE AT OUR STORE IN DENTON, NC. JENSON & JOHNSON PARTS............................... Click on photo above to enlarge. 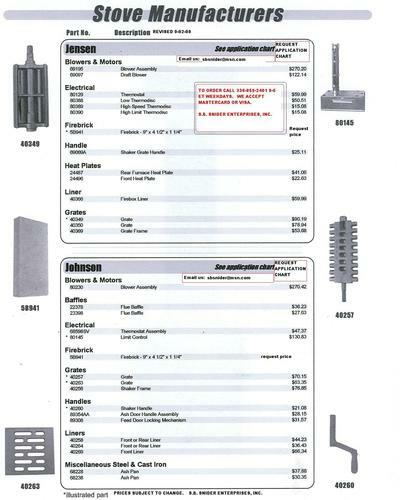 JOTUL PARTS.............................................. CLICK ON PHOTO ABOVE TO ENLARGE. 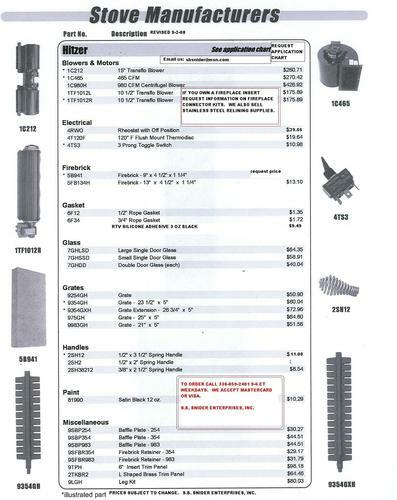 Email us to request APPLICATION CHART....................................FOR PARTS by stove manufacturer (K thru W) KING STOVE thru XTEC................ CLICK ON: STOVE PARTS-PAGE #3 (K-W) on menu at the top of this page.